Jogging can reduce stomach fat. Having a sleek, toned stomach never goes out of style. Despite having a packed schedule, you can still find time to head out for a jog. You may wonder if jogging has any other advantages other than helping you burn calories, relieve stress and build lean muscle mass in your legs. When it comes to your stomach, jogging helps shed abdominal fat, strengthen core muscles and provide numerous other benefits. All that jogging does add up to an efficient, multifunctional exercise by combining cardio and core muscle activity, according to a study published in “Applied Physiology, Nutrition and Metabolism” in 2009. And the more athletic you are, the greater abdominal muscle activation you’ll have while jogging. In the study, triathletes and active non-runners ran on a treadmill for 30 minutes at a rate of 60 percent (jogging) and 80 percent (running) of their maximum heart rate. Regardless of the rate, the triathletes showed the greatest overall muscular activation, specifically in their obliques and back muscles. You don't have to be a triathlete, however, to engage your stomach muscles while running. You don’t have to spend loads of time doing crunches to tone your stomach. Visceral and subcutaneous fat are the most commonly found types of fat on your stomach -- and spot exercises such as situps can’t get rid of it. Research found that heading out for a jog most days of the week is the most effective way to shed a few inches from your abdomen. When individuals jogged 20 miles per week, they lost both visceral and subcutaneous fat, according to a study published in “Diabetes Care” in 2009. Those that jogged 12 miles per week put on no visceral fat and non-exercisers gained 9 percent in visceral fat in six months. A 160-pound woman can burn 303 calories in a 30-minute jogging session at a pace of 5 mph. 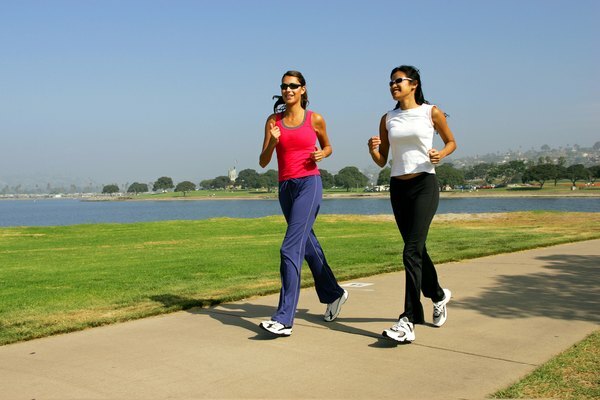 Compared to other activities, jogging is one of the more efficient ways to burn calories. In 30 minutes, that same woman would burn 157 calories walking, 211 calories swimming and 146 calories cycling at a leisurely pace. While your lungs aren’t located in your stomach, they are controlled by your diaphragm, which separates your chest and your abdomen. In combination with a few other muscles that lie between your ribs, your diaphragm controls how you inhale and exhale. By making sure you are a "belly breather" while you jog, you can save energy, allowing you to run farther and longer. When you inhale, your belly should fill up like a balloon. If your chest moves the most while you are jogging, then you are wasting energy moving your shoulders up and down. While bowels may not be a topic you want to discuss, jogging can help you get your stomach on a schedule. Heading out for a daily jog can regulate your bowel functions. This is particularly true when you jog around the same time every day, according to the University of Michigan. Because you probably break a sweat while you are jogging, remember to rehydrate afterward. Drink about 1.5 to 2.5 cups of water following your jog. Can Sit Ups & Core Work Increase Your Waist?